This video takes adorable to a whole new level - watch it below! Pink and her 7-year-old daughter in studio / Youtube. Pink and her 7-year-old daughter sang a song from the musical 'The Greatest Showman' together and the video is too cute for words. 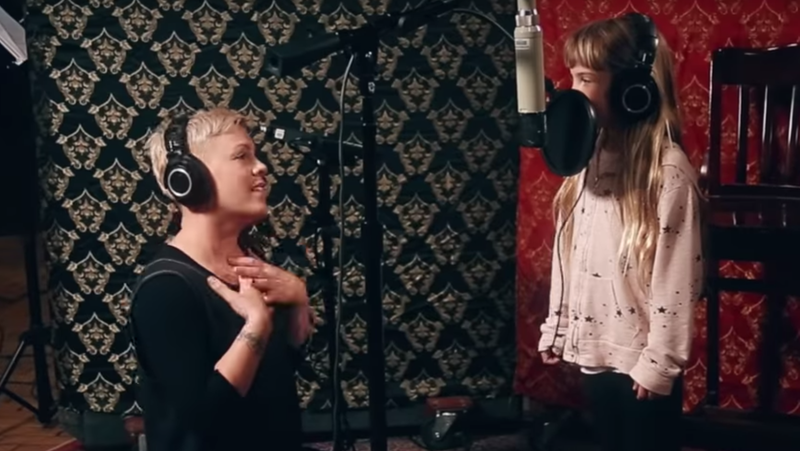 Pink and her daughter, Willow Sage Hart, recently hit the recording studio together and the result? Pure magic! The 'Try' hitmaker and her 7-year-old daughter sang songs from "The Greatest Showman" for a new cover album of the musical soundtrack. Pink sang "A Million Dreams," while Hart is credited with "A Million Dreams (Reprise)." In the video, that has gone viral, the singer is seen kneeling at her daughter's side and encouraging her as she sang. What do you think of this adorable video? Comment below.